You know what I like? Print stylesheets! I mean, I’m not a huge fan of trying to get the damn things to work consistently—thanks, browsers—but I love the fact that they exist (athough I’ve come across a worrying number of web developers who weren’t aware of their existence). Print stylesheets are one more example of the assumption-puncturing nature of the web: don’t assume that everyone will be reading your content on a screen. News articles, blog posts, recipes, lyrics …there are many situations where a well-considered print stylesheet can make all the difference to the overall experience. You know what I don’t like? QR codes! It’s not because they’re ugly, or because they’ve been over-used by the advertising industry in completely inapropriate ways. No, I don’t like QR codes because they aren’t an open standard. Still, I must grudgingly admit that they’re a convenient way of providing a shortcut to a URL (albeit a completely opaque one—you never know if it’s actually going to take you to the URL it promises or to a Rick Astley video). And now that the parsing of QR codes is built into iOS without the need for any additional application, the barrier to usage is lower than ever. So much as I might grit my teeth, QR codes and print stylesheets make for good bedfellows. For now, I’ve got the QR code generation happening on The Session for individual discussions, events, recordings, sessions, and tunes. For the tunes, there’s also a separate URL for each setting of a tune, specifically for printing out. I’ve added a QR code there too. 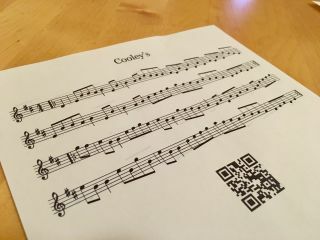 I’ve been thinking about another potential use for QR codes. I’m preparing a new talk for An Event Apart Seattle. The talk is going to be quite practical—for a change—and I’m going to be encouraging people to visit some URLs. It might be fun to include the biggest possible QR code on a slide. I’d better generate the images before Google shuts down that API. A nice intro to variable fonts. If I were smart, I’d plot the answers on a graph. I start doing the important stuff, beginning with whatever won’t take too long. Then I’ve got a choice: either do the stuff that’s not all that important, but won’t take long—or do the stuff that will take quite a while, but is quite important. Finally, there’s stuff that’s not important and will take quite a while to do. I leave that to the end. If it never ends up getting done, it’s not the end of the world. I guess it’s not really about estimation; it’s more about prioritisation. Anyway, I’m working on a fun little project right now—the website for one of Clearleft’s many excellent events. There was one particular part of the design that I had estimated would take quite a while to do, so I didn’t get around to it until today. It was a layout that I figured would take maybe half a day of wrangling CSS. I used CSS grid and I was done in five minutes. That’s not an exaggeration. It was literally five minutes. Normally my next step would be to figure out how to translate those wishes into floats and clears, or maybe flexbox. But this time, there was almost no translation. I could more or less write the CSS like I would write English. I want these elements to be arranged in rows of three columns. I want that particular one to always be in the last column of the top row. That was it. I was done. I think I may need to recalibrate the estimation part of my brain to account for just how powerful CSS grid is. Patrick is thinking through a way to implement :focus-visible that’s forwards and backwards compatible. Everything old is new again—sometimes the age-old technique of using a 1x1 pixel image to log requests is still the only way to get certain metrics. While tracking pixels are far from a new idea, there are creative ways in which we can use them to collect data useful to developers. Once the data is gathered, we can begin to make much more informed decisions about how we work. These experiments with transitioning variable font styles on hover might be silly, but I can see the potential for some beautiful interaction design. A starter kit of CSS that gives you some basic styles that you can tweak with custom properties. For when you don’t need the whole boot. Shoelace doesn’t ship with a grid system because you don’t need one. You should use the CSS Grid Layout instead. The developers are afraid of the CSS.